Cortina d'Ampezzo, the so-called "Capital of the Dolomites" is situated in Belluno Province, Veneto. This famous resort was the host of the the 7th. Winter Olympic Games in 1956 . Descending into the town, I was welcomed by the probably unofficial flag of the town: A red flag charged with a white squirrel on skies. 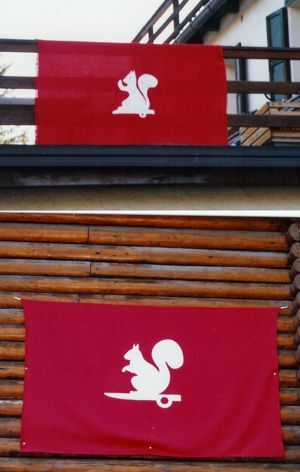 I don't know what is the story behind it but many such flags (in few variants of the squirrel) appear on many houses in Cortina. You can see two variations here). 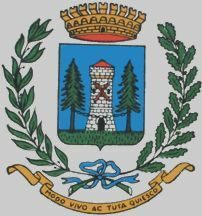 The squirrel is probably the town logo as it appear also at its official website at <www.cortina.dolomiti.com>. 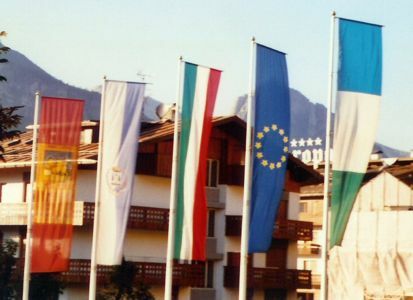 Entering city center, and there are five flag poles with flags of: Ladins, EU, Italy, Cortina (vertical) and Veneto. 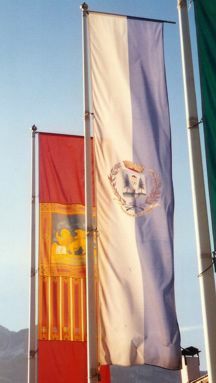 Horizontal variant of Cortina's flag are at the city hall and at the local sport center together with sign with the Coat of Arms. Photos taken by Eli Gutterman & Dov Gutterman. 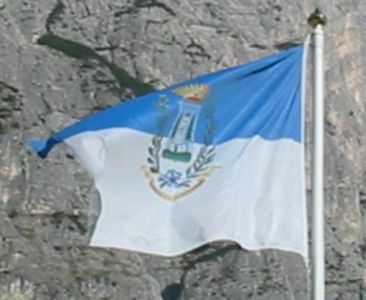 The civic flag of Cortina d'Ampezzo, even in use, is unofficial. Unofficial use of local flags is quite common in Italy. A flag of light blue-white-light blue vertically striped, with Coat of Arms on the white, was officially adopted in 1956 (olympic year) and it does not turn out to be abolished or changed up to now. The white squirrel on a red field, is the flag/logo/emblem of the famous "Scoiattoli di Cortina" (Cortina's Squirrels), a group of climbers founded in 1939. The conquest of K2, the second highest mountain in the world, is due to them (see their website <www.scoiattoli.org>).